Dry, rocky ridges are home to plants that show how tough it is to live there. Gnarled limbs and stunted stature are common on wind-scoured peaks where soil is shallow and poor in nutrients. Many species can be found in better conditions growing tall, straight, and lush, but for Pinus pungens, the Table Mountain Pine, rocky outcrops and shallow soils of ridges are its only home and a short, sinewy shape is its only form. P. pungens is a unique, rugged species with fascinating ecology, and although it is not very common throughout the Chesapeake Bay Watershed, it is a critical member of our highest-elevation forest communities. 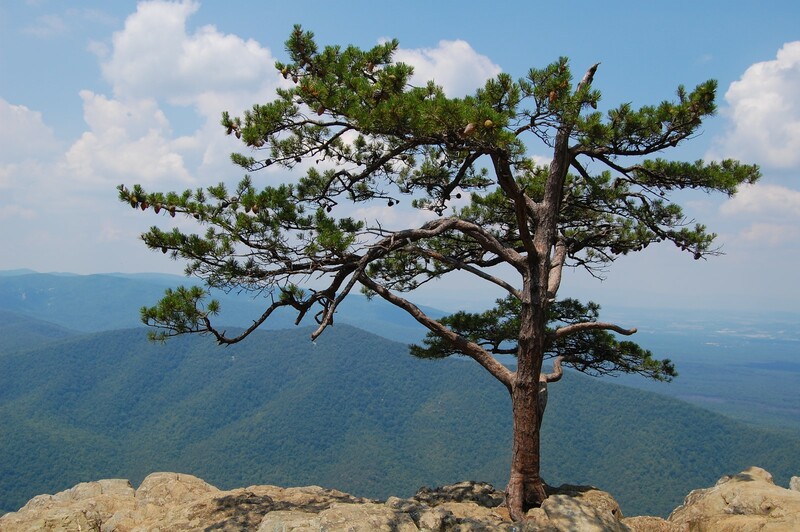 Table Mountain Pine is only found within or near the Appalachian Mountains, stretching in range from northern Georgia to central Pennsylvania. A denizen of higher altitudes and poor soils, it rarely forms dominant stands like many other pines do, but will rather occur individually or in small clusters. Pinus pungens means “sharp-pointed pine” in Latin, referring to the thick, sharp spines of the cone. 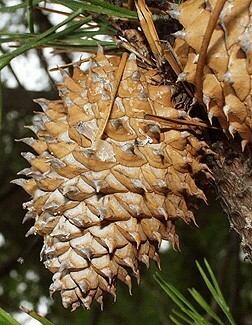 These cones are serotinous, meaning they open to release seeds in response to an environmental trigger rather than opening immediately when mature. Table Mountain Pine’s key triggers are heat and light; these are indicators that conditions are suitable for seedlings to germinate and have a competitive advantage. P. pungens is a pioneer species; it can quickly become established in recently disturbed sites, but without stand disturbance it will eventually be grown over and excluded by species like maples and oaks that are taller and better-adapted for occupation of older forest stands. This is why the serotinous cones are so important; the heat and light required for seeds to be released indicate that there has been a disturbance event and the seedlings will be more likely to become successfully established. In an environment where there isn’t much deep soil, the closed cones in the canopy function as a seed bank for a future generation. Large crown fires are important to Table Mountain Pine regeneration; they open the cones, provide light to the understory, set back competition, and prepare the seed bed for P. pungens growth. In the high elevations where Table Mountain Pine is found, fire was likely relatively infrequent historically, occurring every 50-100 years. When fire would arrive, there would be such high fuel loads that much of a stand would burn, leaving few living trees but plenty of room for P. pungens to germinate and grow. A more frequent fire regime, where most canopy crowns don’t burn but the understory gets set back, can also support Table Mountain Pine, and other disturbance events, such as windthrow or timbering, can result in seeds being released too. Fire is by far the most critical kind of disturbance to trigger seed release and successful regeneration by Table Mountain Pine though, and a history of suppressing all fires has led to the exclusion of the tree on many sites. Periodic fire shaped the ecology and evolution of North American forest species, and P. pungens is no exception. Luckily, scientists and agencies have begun to understand the importance of periodic fire for many species and ecosystems, and have began incorporating prescribed, controlled burns as a management tool. 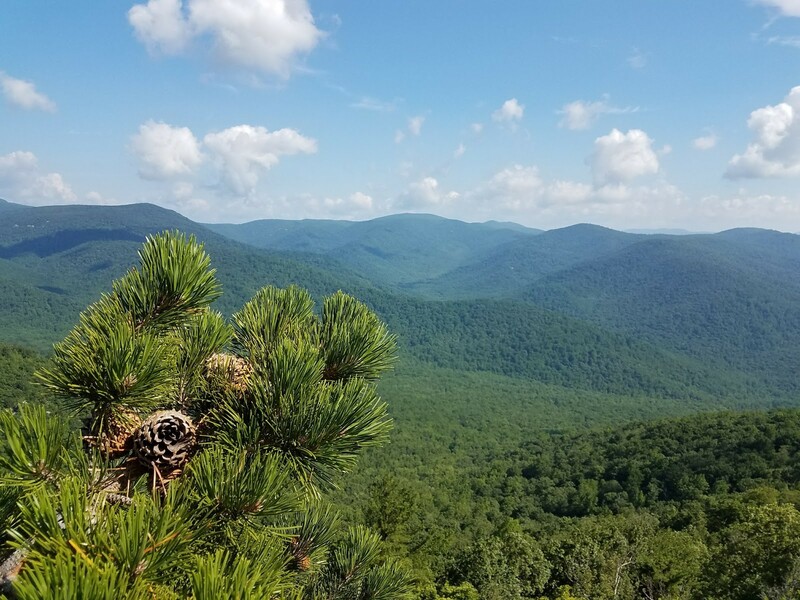 It may seem counterintuitive, but the persistence of Table Mountain Pine and many other species within the Chesapeake Bay Watershed hinges on fires, even large ones that kill mature tree individuals. P. pungens is a textbook example of a fire-adapted species, and its odd looks, resilience to tough environments, and importance as a pioneer species make it an interesting and critical member of our forests. For more information on the Table Mountain Pine and other species, visit forestsforthebay.org or contact Ryan Davis at rdavis@allianceforthebay.org.